3 generations of the Piggott family breeding prime lamb sires at Illoura for nearly 80 years. 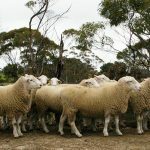 We have one of the largest offerings of white suffolk prime lamb sires in Australia to choose from. We continue to source the best genetics to produce sheep with better growth rates and muscling to meet the demands of the prime lamb market today and into the future. Illoura rams are OJD MN3 accredited, Brucellosis free, Lambplan tested, paddock reared with a strong Mallee constitution & they’ve been through a full dipping, drenching & vaccination program. Satisfied repeat customers reap the rewards of using Illoura genetics when selling their lambs at market.